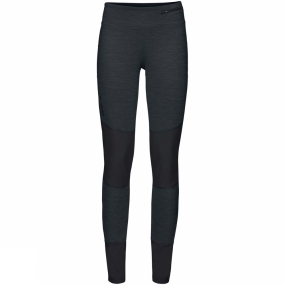 The Womens Scopi Tights from Vaude are super stretchy leggings for athletic mountain tours. The slim fit combined with a high percentage of stretch fibers ensures maximal freedom of movement and exceptional comfort. The wide waistband keeps them in place without binding. There's a small pocket in the waistband for keys or cash. The knees and seat have abrasion-resistant reinforcements. The Vaude Green Shape label stands for environmentally friendly, functional products made from sustainable materials.